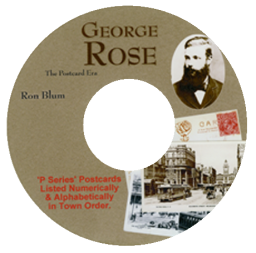 The contents of the disk has been compiled by Ron Blum as an optional extra to his book George Rose, the Postcard Era, first printed in 2011. The Rose Stereograph Company first started producing the ‘P Series’ postcards in 1913 and continued until 1967 at which time they switched to machine manufactured colour postcards printed by an outside firm. The ‘P Series’ postcards as listed in this disk are the ‘Real photo’ type made in black and white (or sepia) and hand produced in the company’s chemical darkroom at Armadale, Victoria. In browsing through the lists the reader will observe much duplication of numbering, such is the way it is. For more information on these postcards or the Rose Stereograph Company who produced them, please refer to the above mentioned book or its companion George Rose, Australia’s Master Stereographer. Towns and locations alphabetical listing by Australian State. Postcard titles in numeric order. (Over 18,000 listed). Australian Capital Territory postcard titles in alphabetical town order. New South Wales postcard titles in alphabetical town order. Queensland postcard titles in alphabetical town order.